In the steampunk world of Victorian London, a beautiful vampire seeks out the author of Dracula–to set the record straight . . . If one is to believe Bram Stoker’s legendary vampire tale, Lucy Weston is Dracula’s most wanton creation, a sexual creature of the night who preys on innocent boys. But the real-life Lucy is nothing like her fictional counterpart—and she demands to know why the Victorian author deliberately lied. With Stoker’s reluctant help, she’s determined to track down the very fiend who transformed her—from the sensual underworld where humans vie to become vampires, to a hidden cell beneath a temple to madness, and finally into the glittering Crystal Palace where death reigns supreme. 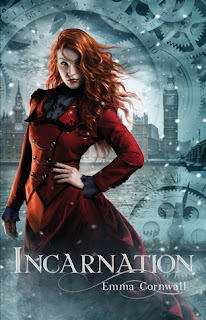 Emma Cornwall's Incarnation is a seamless blending of Victorian sensibility, steampunk ingenuity, and creatures of lore and legend. Young Lucy Weston is a newly turned vampire on the hunt for so much more than her next meal. She is a girl bent on discovering the whereabouts of the elegant stranger that is responsible for her transformation; and by extension the loss of her former life. Lucy is a wonderful character, young but fully aware of what she must do and more than willing to embrace both the pleasure and the pain of her new status as vampire. Though it is quite clear that Lucy loves her family, it is quite clear that she is a forward thinker and not one to shrink from the obstacles that being both a woman and vampire in Victorian England present. While it is true that Lucy is clearly the star of this story, she is not always its focal point. Throughout the course of this tale, readers will be introduced to all manner of person and creature. Readers will love the fact that this novel flows quickly from scene to scene; never allowing the story to stick in one place or another. So too, the characters work like perfect puzzle pieces, locking together flawlessly to present a beautifully depicted tableau of mystery, love, promises, lies, betrayal, and blood lust.